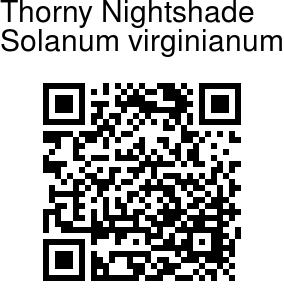 Thorny Nightshade is a herb which is erect or creeping, sometimes woody at base, 50-70 cm tall, copiously armed with sturdy, needlelike, broad-based prickles 0.5-2 cm × 0.5-1.5 mm. Leaves are unequal paired; stalk 2-3.5 cm, prickly; leaf blade ovate-oblong, 4-9 × 2-4.5 cm, prickly along veins, margin usually 5-9-lobed or pinnately parted, lobes unequal, sinuate, apex acute. Inflorescences elongate racemes 4-7 cm. Sepal tube is bell-shaped 1 cm in diameter. Flowers blue-purple, 1.4-1.6 × 2.5 cm; petals ovate-deltate, 6-8 mm, densely pubescent with stellate hairs. Filaments 1 mm; anthers 8 mm. Style 1 cm. Fruiting pedicel 2-3.6 cm, with prickles and sparse stellate hairs. Fruiting sepals prickly, sparsely pubescent. Berry pale yellow, 1.3-2.2 cm in diameter. Flowering: November-May. 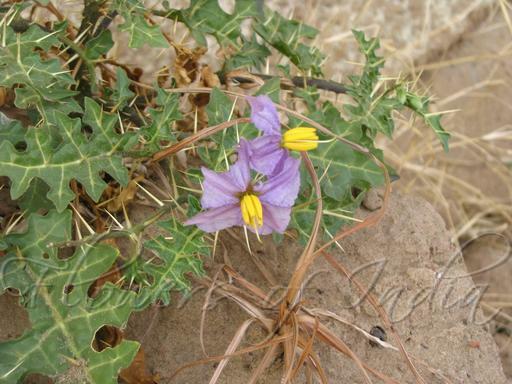 Medicinal uses: Boiled decoction of dry plant is prescribed for stomach and liver complaints. Photographed in Goa & Gujarat.